Q. I love dried fruit and thought it was healthy. But I hear that you gain a lot of weight eating dried fruit, which is not healthy. What's the truth? A. The truth is that the actress and comedian Mae West was wrong when she allegedly said "Too much of a good thing ... can be wonderful!" Food contains calories, and eating too many calories-even of healthy foods-leads to weight gain. But there are healthy calories and unhealthy ("empty") calories, and fruit is a healthy source of calories. That's as true of dried fruit as fresh fruit. There are some caveats, however. Because dried fruit is so much smaller than the fresh fruit from which it comes, it's easier to consume a lot of calories eating dried fruit. I rarely eat three fresh apricots or 30 grapes in the course of a few hours, but I frequently consume more than three dried apricots and 30 raisins in a few hours. Another matter of concern is that some dried fruit makers add sugars to dried fruit (which already contain their own natural sugars). When the new Nutrition Facts labels approved by the government start appearing, the amount of added sugars in a serving will be easy to determine. 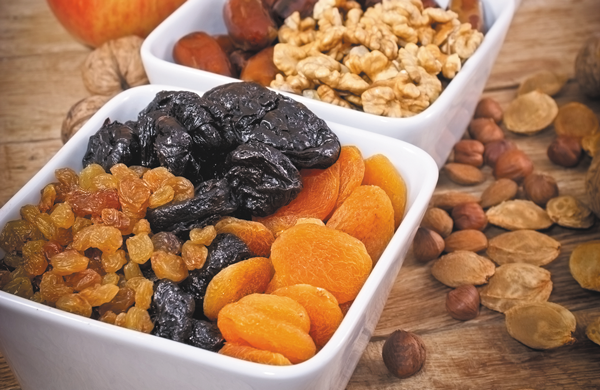 Dried fruits also contain more fiber and more of the antioxidants called phenols than fresh fruit, per ounce. Fiber fights heart disease, obesity, and some types of cancer (although its possible protective effect against colon cancer is controversial). People with diets rich in plant phenols have lower rates of heart disease, diabetes, several kinds of cancer, and possibly degenerative brain diseases. So, by all means keep eating dried fruits: they are full of healthy nutrients. But avoid the added sugars, and keep track of calories.